That can put a bit of a dampener on things if you take your boat to a new location or off on a holiday. Whether you’re exploring new waters, trying a different location, or you’ve just bought your first boat, the following tips will help you find boat fishing spots, no matter where you are. There are plenty of online sources where you can find other people’s favourite fishing spots. Wherever you’re planning to go fishing, do some online research to see if there are any particular spots marked or mentioned on fishing sites and forums. Basically the analogue version of the above – go out and ask the locals. Many fishermen will be happy to share where you can catch what, with what bait. Locals are more likely to know what will be biting at what time of year too. The best locals to ask are usually those either working in the local tackle shop, or spending a good amount of time there. However, if someone has a sweet spot, they might want to keep it secret so it doesn’t get too crowded. If you’re only in the area on holidays, be discrete and point out that you’re just looking for a spot for a couple of days. With a simple Google search it’s not too hard to get your hands on some topographical maps for the area. Look for areas where a topographical line crosses a river, stream or trench, indicating a sudden drop in elevation. A deep pool within the water, whether it’s a lake, river or coastline, can be a hotspot for fish and your new favourite fishing hole. Make sure you use Google maps to work out the exact coordinates, which you can then put into your boat’s navigation system. Fishing Tip: no matter what fishing spots you find, try them out either early in the morning or late in the afternoon for the first time. You can’t judge a fishing hole based on the worst time for fish to be biting. If you’re willing to spend some money, there are some fantastic fishing apps out there that include interactive fishing maps. With ChartedWaters.com.au you can search by fish, bait and season, as well as see topographical information and waypoints. While the above points will help find fishing spots, technology such as depth sounders, or ‘fish finders’, can often help you find where the fish are on that particular day. Any fishing spot can have bad days, but with the aid of your echo sounder you can find which spot has the most activity right now. 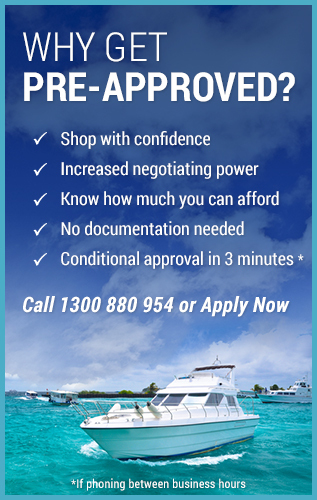 If you’re in the market for a new fishing boat, or you’d like to repower your current boat, talk to us at BoatLoans.com.au. We can help with preapproved finance, marine insurance and even extended warranties in some situation. Call us on 1300 880 954 or simply apply online today.